Mehsana is an ancient city, displaying many evidences of its chronology. 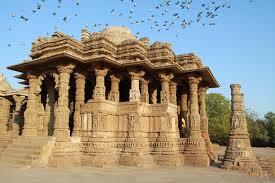 In that one of the prime locations is Sun Temple at Modhera in Mehsana region. It is the prime place of Mehsana tourism where travelers must take a visit. Tourists having attraction towards the significant places of ancient times cannot effort to miss the glimpses of this exquisite temple. It showcases the aura of Solanki Dynasty during which this temple was incepted. It is strongly believed that Solanki Dynasty was the golden era of this region and many artistic splendors are established during this regime itself. Now this site is under Archeological Survey of India. 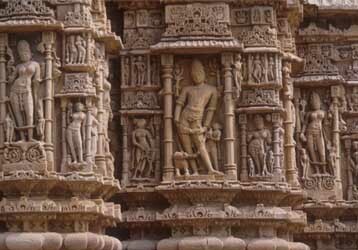 Modhera Sun Temple presents the eclectic view of beautiful architecture and exotic designs. It was constructed by King of Solanki Dynasty, Raja Bhimdev in 1026 AD. At that era, people had strong belief in five elements of nature i.e. fire, earth, air, water, and sky. They used to be paramount force on earth parallel to Vedic Gods. These elements supposed to be strong and ethnic energy which is said to be driving force of human existence. The positivity of energy is seen in every architectural design of this sun temple. Today, it is quite lonely place with wind blowing over soothing the mind of visitors, once used to be main iconic religious places of Mehsana. 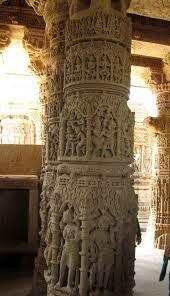 Mehsana district has been established in 14th century, after the inception of Modhera Sun Temple. Sun Temple of Modhera was constructed during the rule of Rushabh Bhimdev. He was renowned King of Solanki Dynasty which was believed to be suryavanshi, the follower of Sun God. Anahivad Patan used to be their capital city at that time and they constructed many significant places of religion in the region of Mehsana. The foreign invaders like Allauddin Khilji tried to destroy this majestic beauty of architect, but splendor of art is still intact in ruins of Modhera Sun Temple. Sun Temple of Modhera is superbly architect during the Solanki regime. The exterior of Modhera Sun Temple depicts the different pose of Sun (Aditya) God sculptured. The inner part is diversified into three separate compositions, Surya Kunda, Guda Mandap and Sabha Mandap. These three parts are main soul of attraction which constructed with utter significance and sheer brilliance. Surya Kund is the prime of all three, and also called as Ramakund. It is rectangular shaped tank constructed as stepped stairs design which was usually done in ancient tanks. It is surrounded by 108 Gods of Hindu community, crafted on the stairs of Kund, which is splendor of craftsmanship that era. This Kund is believed to be holy and devotees coming for devotion take plunge in this tank before offering prayers in Sun Temple. In the earlier times, this tank used to be filled with fresh water. 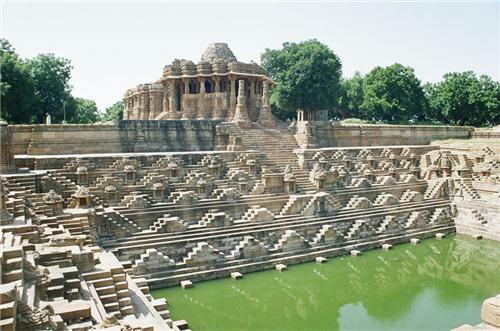 The architecture of Kund is superbly done in geometric pattern which is in itself a splendid attraction of Sun Temple. While reaching down to pyramid shaped steps there are four shrines of Lord Ganesha, Lord Vishnu, Lord Shiva and Shitalamata established, facing the main shrine of Sun Temple. Every relics of sun temple narrates the magnificent saga of this region. Two, wonderfully constructed Torans or gateway on the Kund gives entrance into Sabha Mandap of this sun temple. The Sabha Mandap is used for religious public gatherings. It is comprised of big atriums which are pillared by 52 columns. These pillars represent 52 weeks in a year. It is wonderful to know that astrology and religious places have such relevant co-relation with each other in chronology of Indian subcontinent. The wall of this Sabha Mandap displays the highlighted incidents and stories of renowned epic, Ramayana and Mahabharata. Sanctum Sanctorum is the main temple. 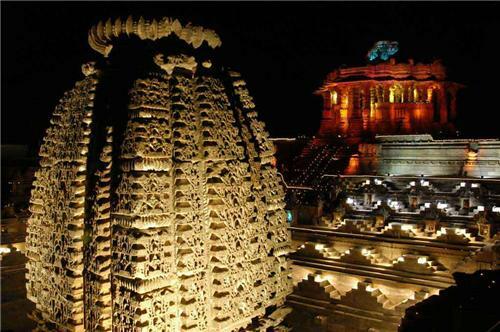 This temple is constructed on plinth of lotus in such way that the rays of sun on 21st of June i.e. summer solstice used on fall straight on the pure gold idol of Sun God riding his chariot with his Saarthi Arun. This chariot had seven horses and his charioteer sits on the fourth horse. There was this huge gold idol of Sun God along with his chariot and charioteer which was looted by Mahmud Gazni who also took away all the gold from this magnificent temple. The exterior wall of Sun Temple has beautifully carved twelve postures of Sun or Aditya. These 12 postures represent position of sun in 12 months. These carvings depict him with 12 dikpals, Varundev, Agnidev, Goddess Saraswati, Lord Ganesh, and Lord Vishwakarma. Though any part of year can be deemed fit to admire the splendor and grandeur of this temple complex, it should be preferably visited in winter season. 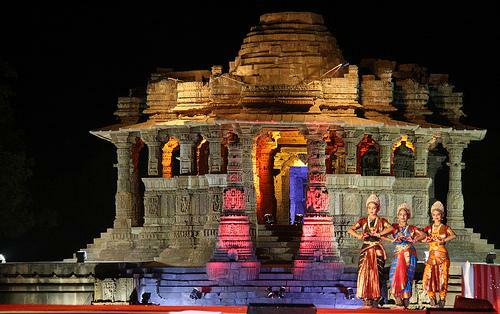 Along with cool and soothing climate, this season also witness the grand Modhera Dance Festival. This dance festival is organized every year in the third week of January month to mark the elegance of this temple. The whole complex is illuminated with millions of light and in between you can hear the sweet sounds of temple bells producing a mesmerizing ambiance, calm enough to lose yourself in its sanctity. Hence, this can be the best time to visit this temple and enjoy these colorful festivities as well. Modhera Sun Temple is located at a proximal distance from Mehsana city. You can easily reach this destination by regular buses and taxis running between the two places. It takes hardly 10 - 15 minutes to reach here from Mehsana. It is better to visit this tranquil location by a private vehicle as it can take one full day to enjoy its calm environ and religious sanctity.